The Hopi Reservation is in northern Arizona east of Flagstaff and completely surrounded by the Navajo Reservation. The village of Old Oraibi on Third Mesa is one of the oldest continually inhabited sites in North America and the Hopi pottery tradition is equally old. 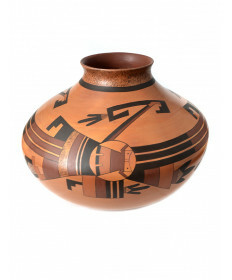 The Hopi clay body is iron rich and can fire from a cream to light red. 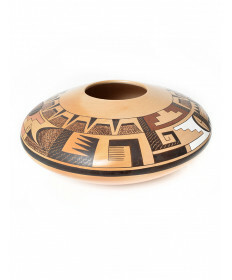 Early 19th Century Hopi pottery takes its influence from Zuni and employs a white slip under the decoration. 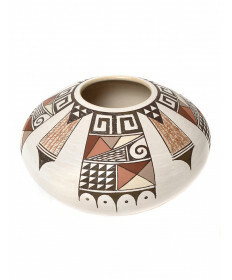 This early white slip pottery is called "Polacca Ware" and Hopi potters used it almost exclusively until the late 19th Century when they started recreating designs from ancient pottery at the encouragement of a local trader named Thomas Keam. 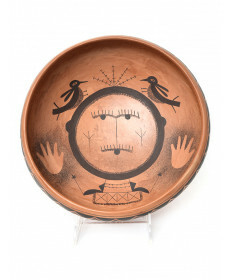 The most famous of these potters was a woman named Nampeyo (1860- 1942). 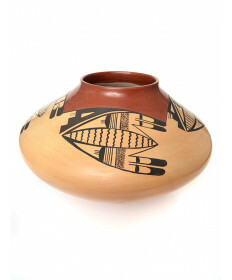 Her innovation was to abandon the use of the white slip the Hopis had learned to use from Zuni and create her decorations directly on the polished clay body just like the ancient pottery. 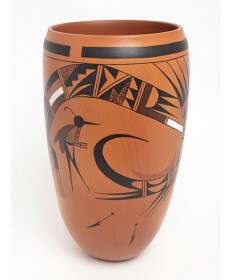 Nampeyo also re-created the designs found on ancient pottery excavated at the ruins of the Hopi village of Sikyatki, which was excavated by J. Walter Fewkes in 1896 and from which the style takes its name: Sikyatki Revival. The word Sikyatki means "yellow earth". After 1925, some artists also started creating work with a red slip. Despite the popularity of Sikyatki Revival, pottery made using the white slip is still carried on by the Navasie/Naha families and is now called "Walpi Polychrome." 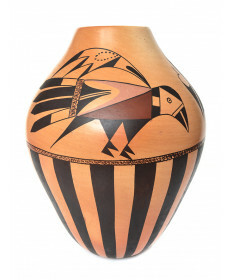 The tremendous diversity of design and technique in Hopi pottery stands as testament to its long history and the care with which today's Hopi potters seek to preserve their heritage while continuing to innovate.